Help safely welcome thousands of riders and visitors from across the country when RAGBRAI stays overnight in Iowa City on Friday, July 27, 2018. 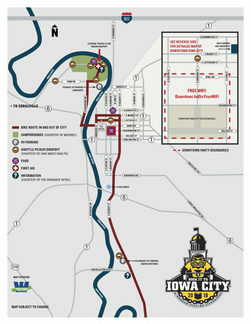 Cyclists will be enjoying all parts of the City and University of Iowa campus, so caution is urged when driving near the route and in the Downtown area. Plan your commute and travel accordingly. Expect delays due to street closures, and heavy cyclist and pedestrian traffic. Drivers will notice vehicles on Park Road Bridge. It is still under construction, but will be temporarily accessible to RAGBRAI registered vehicles only. No pedestrians, cyclists or local traffic is allowed on the bridge at any time. Avoid the Dubuque Street and Park Road Bridge area. Traffic will be heavy due to RAGBRAI support vehicles. Be cautious and on the lookout for bicyclists while commuting to and from work as riders make their way into Iowa City and through the Downtown area, starting early Friday morning. Riders may begin arriving as early at 8 a.m., with the majority arriving between 11 a.m. and 3 p.m. Support vehicles will begin arriving as early as 5 a.m. and will be using Dubuque Street. Drivers should avoid it. Motor vehicle drivers are asked to avoid the ride route. Some areas will be completely closed, and other portions will intermittently close throughout the day. Entering and crossing roads along the route will be difficult. Traffic cross points on the route include McCollister Boulevard, Highway 6, Kirkwood Avenue, and Burlington Street. *The route in and out of Iowa City is nearly identical. The only difference is that riders will enter using Market Street on Friday, and exit using Jefferson Street on Saturday. View the route map. Iowa Avenue westbound will be reduced to one lane between Madison and Riverside Drive, open to passenger vehicles no large trucks. Note: several large charter groups will host thousands of cyclists in the Mercer Park area. To access the camp space, riders will travel Highland Avenue to Lower Muscatine Road to Mall Drive to First Avenue to Bradford Drive. It is advised that drivers avoid this area. *Park Road Bridge will only be accessible to vehicles registered with RAGBRAI. No pedestrians, cyclists or other vehicles will be allowed on at any time. RAGBRAI Drivers should take note that the bridge is still under construction and proceed with caution. The bridge will close to RAGBRAI registered traffic at 6 p.m. and reopen only to them at 5:30 a.m. before closing again at noon on Saturday. Downtown Iowa City will host the Book it to Iowa City Bash with headline artists The Jayhawks and Blitzen Trapper. Guests will be allowed to visit local bars and restaurants and openly enjoy food, beverages and special programming within the event’s designated area. Set up began at 6 a.m. on Thursday with closures on Iowa Avenue between Clinton and Dubuque streets, as well as Clinton between Jefferson and Washington streets. 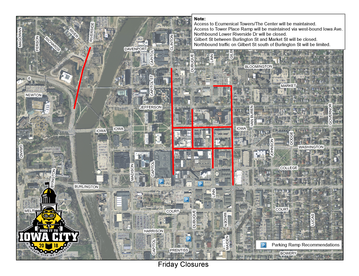 Visitors should avoid using the Tower Place Ramp, 335 Iowa Ave., due to street closures and volunteer parking, as well as the Chauncey Swan Ramp, 415 E. Washington St., due to the Rummage in the Ramp event, and the Farmers Market, which opens at 7 a.m. on Saturday. Iowa City buses will offer free rides all day on Friday, July 27. The Downtown Interchange has temporarily relocated to the Court Street Transportation Center, 150 E. Court St., starting Thursday, July 27. Normal service will resume Monday, July 30. More info at www.icgov.org/transit. Give bicyclists room. Do not pass closely. Allow at least 3 feet or move into an adjacent lane. Be patient. Wait to pass bicyclists until you are able to do so safely. Reduce speed when passing. Even if there is a bike lane, an opening car door or crack in the road may cause a bicyclist to swerve unexpectedly. Check blind spots. Make sure to check your blind spots before making turns and before opening car doors if parked on the street.